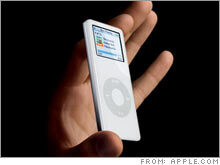 New nano and video iPods face chip, battery issues, analyst says; stock hits 8-month low. NEW YORK (CNNMoney.com) -- The next generation of iPods, which investors are eagerly awaiting to boost Apple's sales, could face major delays, according to an analyst who follows the company. Apple (Charts) stock sank about 3 percent in active Nasdaq trading, hitting its lowest since late last October. The new iPod nano may need to incorporate a chip from a new supplier, and the developers of the video iPod may need to find a way to beef up the player's battery life, according to Shaw Wu of American Technology Research. The new nano was expected in the third quarter, but will likely be pushed back to December, he said. And the new video iPod could be delayed until the first quarter of 2007 instead of the end of 2006, Wu wrote in a note to clients. Wu believes the nano delay is because Apple is switching from chips made by supplier PortalPlayer (Charts) to those from another chipmaker. He expects the capacity of the nano to double to 4 gigabyte and 8 GB, from 2 GB and 4 GB. The challenge for Apple engineers on the new video iPod is to increase screen size and improve the battery life - goals which are hard to achieve simultaneously. Apple is considering software and hardware methods of improving battery life, the analyst wrote. He said the company will also introduce a new high-end iPod. Despite these concerns, Wu maintains a "buy" rating on Apple because he believes it offers a unique mix of hardware, software and services.